We will now take a look at the possibility of using a small differential on an off-road kart to make the verticle power driven shaft of the engine drive a rear horizontal axle. Advantages of using a Differential!!! Well in Fact nearly every car has one!. 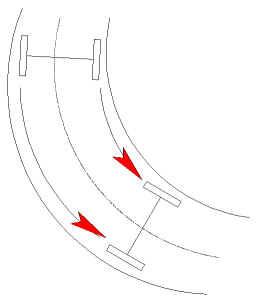 (Apart from the cars with belt driven drive in which case the two seperate belts can slip a certin amount to take the strain) It is the only way to achieve smooth driving around corners. When any 3/4 wheeled viehicle goes around a corner the outside wheel must go faster than the inside wheel. You can see from the picture to the left that somehow the outside wheel has to go faster than the outside wheel. A Differential transmits the power seperately to each wheel. A big disadvantage if in muddy terrain. If one of the rear wheels gets caught in ahole etc. then all the power will get transmitted to this wheel because it is the path of least resistance.. Therefore your stuck and there's no hope of going anywhere!. Unlike with fixed rear axles. 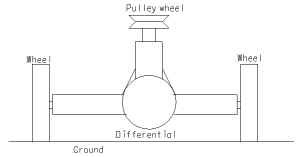 Basically, looking at it in another perspective, with fixed rear axles one can easily perform donuts very easily (spinning around in circles). However Tire ware is immense. When taking corners with a fixed rear axle the inside wheel must slip to keep up with the outside wheel. With a Differential, taking corners is much easier and smoother with no over steering necessary. 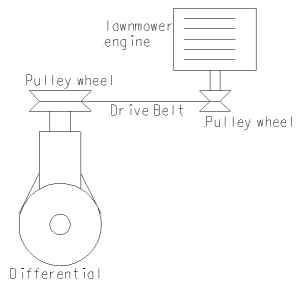 Howeve we want to use a differential for making a lawnmower engine drive a kart. Basically what you want to do is to incorporate the differential into the back axle. It will be to this differential that the wheels will be fixed to. 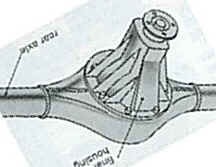 The differential will be fixed in such a fashion as to leave the input power shaft of the differential pointing upwards (vertically). On this shaft a pulley wheel will be mounted which will link up perfectly with the verticle shaft of the engine. I'm not sure would a chain work in this situation, perhaps if enough tension was kept on the chain. I hope you get the idea behind this scheme of things. Hopefully I will set the method up and take a few photos to clarify the idea outlined above. E-mail me if you have any queries.